The first demo is currently 10.3MB zipped (46MB unzipped), which includes a swap file on your hard drive. It has also been available on different Game Magazines (those funky CD-ROMS demo things). The first demo is no longer available since it contains lots of bugs and is greatly inferior to the second demo (below). The demo will run with the Matrox Millenium video card only with 1.9 BIOS which is available from The Matrox WWW Site. It includes Demo versions of the character generator, the item maker, the potion maker, the spell maker, a tour of sites of interest, and a playable dungeon. Your character will be a pregenerated male 16th level spellsword. There will be no save in the demo. The Demo's 3D rotatable automapping function combines areas covered by your various dungeon explorations, until you log out of the Demo proper. The Demo also contains water, no magic items, and some 'eye candy'. Due to space restrictions, there is no monster AI in the DEMO. The dungeon is from the pit of jagadha. The dungeon consists of 4 8x8x8 3D blocks. Each block loosely has 8 "levels": there are many partial levels, intersecting ramps between the levels, stairs, balconies, overhangs and rooms with different height ceilings. This demo is not a beta per se, but it's clearly based on a pre-release build of the game, and there are quite a few noticeable differences. After exiting the game, a message appears that goes "TES: Daggerfall v0.1 completed", although I'm not sure if this could be considered the real version number of the build. Last edited by MrFlibble on Fri Feb 08, 2013 12:06 pm, edited 2 times in total. I still need to find the Betony and 0.1 demos unmodified with their original timestamps from the original CD's. 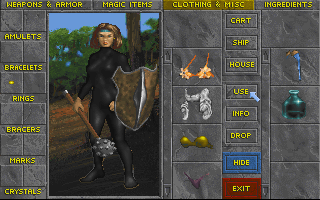 There was also another 0.1 demo I am looking for that is slightly different and has a female character, this demo was released on the European Version of the April 1996 PC-GAMER. An early 0.1 demo was released first with a fifth level character but it was replaced very quickly with the build posted here, probably because it was too difficult. This one is very difficult to find since it was only posted on the old GAMBETA forum in Compuserve which is gone now. Also note that there was a build between the Betony and Standard Demos, which suggests another demo exists somewhere. 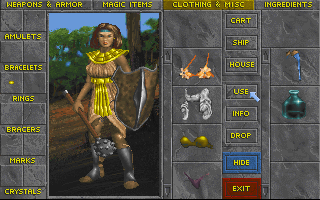 There was also another 0.1 demo I am looking for that is slightly different and has a female character, this demo was released on the European Version of the April 1996 PC-GAMER. An early 0.1 demo was released first with a fifth level character but it was replaced very quickly with the build posted here, probably because it was too difficult. This one is very difficult to find since it was only posted on the old GAMBETA forum in Compuserve which is gone now. Also note that there was a build between the Betony and Standard Demos, which suggests another demo exists somewhere. Interesting! I didn't know other demo versions of the game were released as well. It's a pity many demo/pre-release versions of games from that era that were made public remain obscure for the reason of having been published on CDs no one bothered to upload in the digital form later, or were distributed through BBSs, FTPs and websites that are no longer functional. Files not having been archived by web.archive.org due to robots.txt is also frustrating. I still need to find the Betony and 0.1 demos unmodified with their original timestamps from the original CD's. Litude at RGB Classic Games Forum has been very kind to upload the image of PC Gamer Volume 4 Number 1 (January 1997) CD, which contains the Betony demo. You can get it here. Kudos to Litude for sharing that! "TES: Daggerfall demo v1.0 - 10/07/96 17:37:17"
on the stdout, which is a bit strange. Thank-you MrFlibble and Litude! This is very appreciated! Hallfiry, The 1.0.179 and 1.0.181 are displayed upon exit of the demo and I have yet to check out those French Magazine CD's which may have some more previews or demos on them. I also forgot to mention, I have found the 0.1 demo with it's original timestamps. It came on 'The Elder Scrolls - Daggerfall Interactive Preview CD-ROM' which I'll be uploading soon. The Preview CD is actually on Amazon afaik (But without the box). There was also a demo CD for the limited edition preorders (I wonder what the Daggerfall figurine looked like... it was limited 100 or so). The dates aren't ultra accurate, but I think they are more or less correct. That would be awesome! ^_^ Was that preview CD included with some other product? Distributed with a magazine? Given away at some special public event? seen anyone complain of this, so maybe it's just me. went wrong with the X-Car demo so I couldn't get it to play. edition (which I can't understand why you wouldn't), you don't have to. May I ask you where do you find those old usenet postings? Would be great if you guys could upload all these demos and betas (properly named with version and dates please) to BA so I can put them in our archives. Since the demos are pre-release versions (as I understand it) I'll tag them as (beta demo). Unless I am wrong? Okay, Here's the Daggerfall Preview CD. I never knew about the Demo which came with the Collectors Edition, He mentions that it randomly generates both Male and Female characters which isn't found in any of the other available demo's as far as I know, apart from the demo on the European Version of the April 1996 PC-GAMER which starts you off with a Female character to begin with. Just found some info on the missing 0.1 Demo which was featured on the 'European PC Gamer CD', apparently it was also found on 'PC Power'. Additionally, The 'Betony' Demo was also available on 'PC Games'. Awooo, thanks a lot for sharing that one! So this means there was yet another demo of the game? Nice! No problem! This demo was sold standalone on a CD prior to the release of Daggerfall, it was also the first real public demo of the game. I think the Collectors Edition Demo could be the missing version between the Standard and Betony demos. 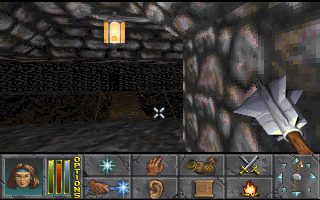 - Daggerfall Demo found on the European Version of the April 1996 PC-GAMER - This is an updated version of the Interactive Preview CD Demo. 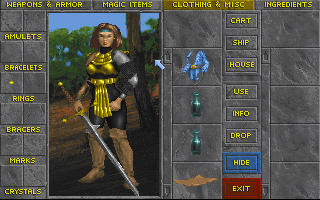 - Daggerfall 'Beta' demo which features a 5th level Spellsword - Was available on the Compuserve GAMBETA forum at some point which is now long-gone and Bethesdas own website. 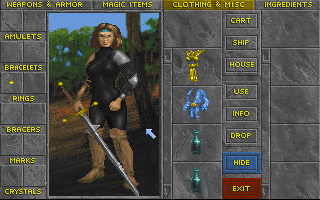 The demo was initially set to be released around August 1995 but it kept getting delayed and was eventually released as a 'Beta Demo', it can be said that this is the rarest of all the Daggerfall Demos out there. It came in two files, dagdemo1.zip (5.38MB) and dagdemo2.zip (4.71MB) respectively. This is also the build which came directly before the Interactive Preview CD. Last edited by dezodor on Wed Feb 29, 2012 5:43 pm, edited 1 time in total. The 6 part demo is the preview cd demo. the other two are the betony demo and the 181 demo again. Yep, we already have those builds. Some further reading has revealed that the 'Collectors Edition' demo is actually the same thing as the European demo! that pre-ordered Daggerfall check out my home page. Additionally, the European demo is an older build than the '0.1 version' from the 'Preview CD' according to Hal Bouma, a Daggerfall programmer at the time. (like change the female to a guy) for the USA version. Back to the early demo, I think it's a pity they decided to drop some features that were going to be in, judging by what can be seen in this release. Apparently, clothes were supposed to play a greater role, protecting from environment and probably also influencing how NPCs would react to and interact with the player character. I guess the distinction between plain and formal clothing that remains in the full game could have been intended to serve the purpose of better interacting with various factions (commoners vs. nobility etc.). Another obvious use of clothes would have been changing the apparel if you're hiding from someone (e.g. the guards). Such features would have generally added to the role-playing side of the game. Out of sheer curiosity, I decided to check if the Betony demo is going to work with the newer EXE from the downloadable dungeon demo (after all, it's a later build of the game and could be less buggy). I took all the Betony files into the dungeon demo's ARENA2 folder, and edited Z.CFG to point to the necessary starting map. It seems to work fine except for one thing: the sky/horizon texture is not displayed at all in outdoor environments, resulting in glitchy graphics. It doesn't seem to be the result of a missing file, so I wonder if it's plain hardcoded in the EXE or can be remedied with editing Z.CFG (there's some variable there called "renderscape", I wonder if it could be somehow related to the problem at hand).